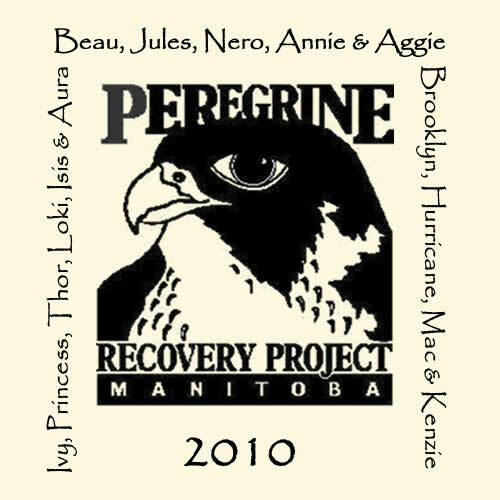 The Peregrine Falcon Recovery Project (Manitoba) is dependent upon financial support from the public to continue its recovery efforts to re-establish a self-sustaining population of wild peregrines falcons in the province. 2011 was a record year for nesting pairs in Manitoba but also a record year for chick mortality. We lost more chicks this year than we have in any other year of the Project's 30 year history. None of our nesting pairs were immune from losing a chick. Even our Radisson pair with its very experienced parents had to work hard to keep their chicks out of the rain and heat. The females spent so much time covering their chicks from the weather that one of our Forum members described them as a "mumbrellas". 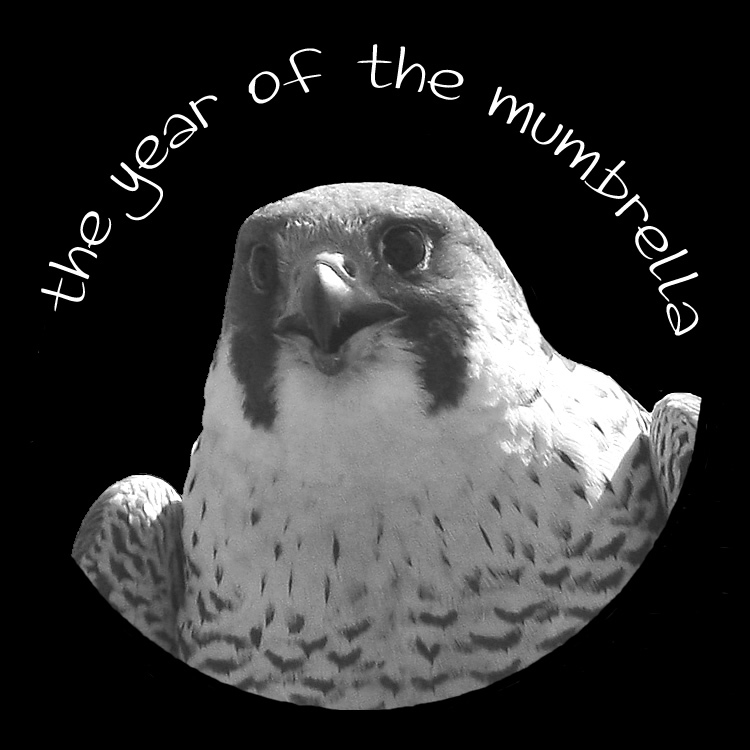 So in honour of the adult females - Princess, Hurricane, Jules, Alice and Kate - who devoted themselves so selflessly to protecting their chicks this year, the 2011 special edition teeshirt design is a black-and-white photo of Princess with "the Year of the Mumbrella" in an arch over her head. 2010 had a number of very happy moments, one was that we had three successful nests for the first time since 1997 and another was that all three nesting pairs chose this year to nest in nestboxes provided for them by the Project. The advantage of using a nestbox is that they all provide protection from snow/rain/wind, provide gravel which helps the adults to incubate eggs/brood their chicks more securely, and the boxes help to keep chicks from getting hurt or fledging earlier than they should. 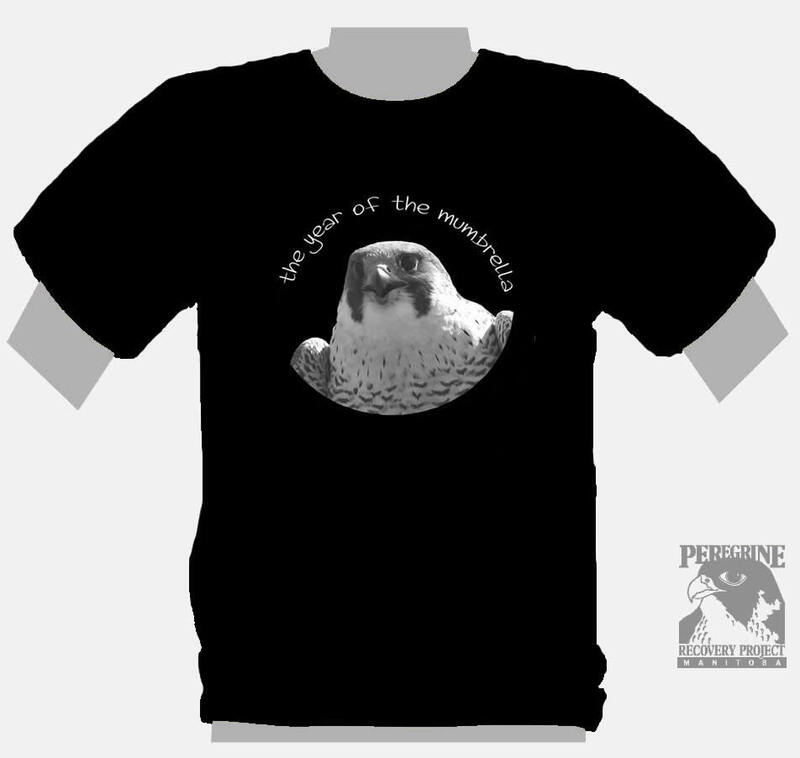 For those reasons, this year's special edition teeshirt front design is a stylized box with peregrine eggs in the middle. 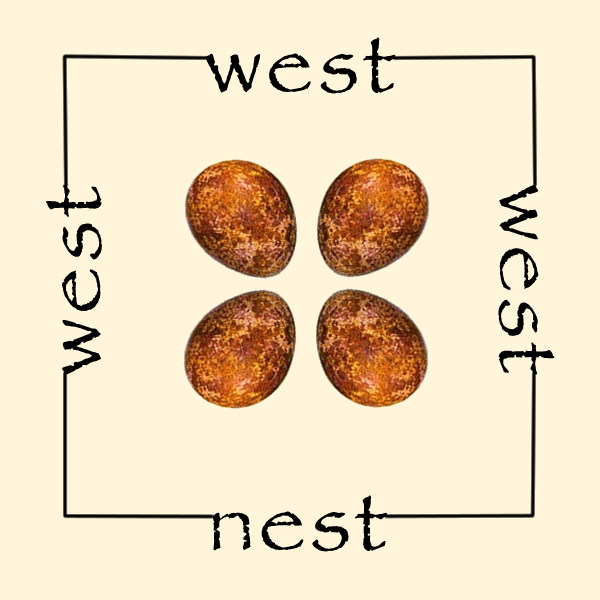 Around the box-edge there are words: "west" for each of our nestboxes - the nestbox on the Radisson is on the west side of the Hotel in downtown Winnipeg, the second Winnipeg nest is in west Winnipeg and our third nest is in western Manitoba on the McKenzie Seeds Building in Brandon. 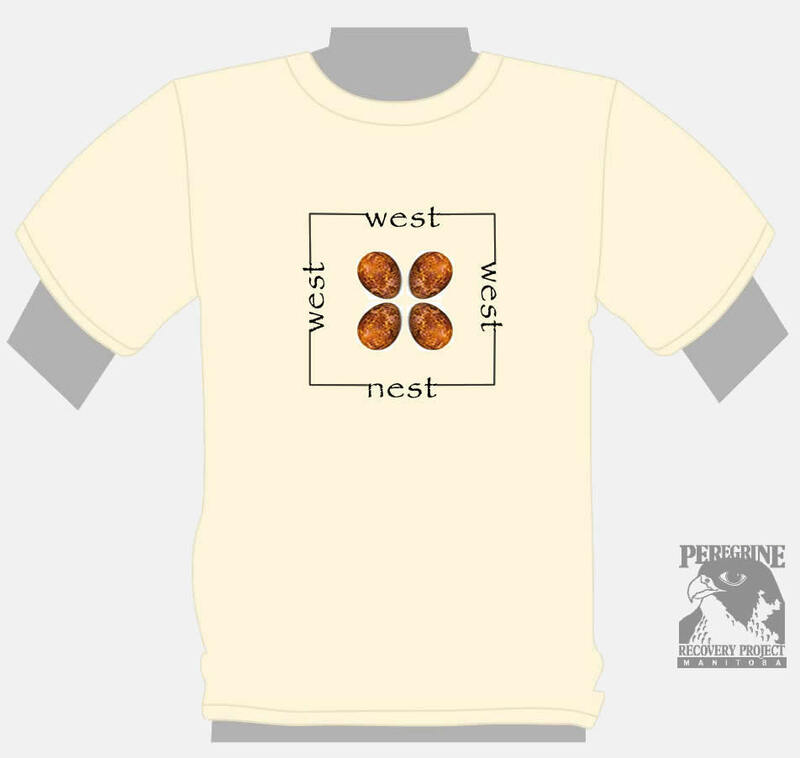 We have added "nest" at the bottom because all three of our nests successfully raised chicks to fledging this year. 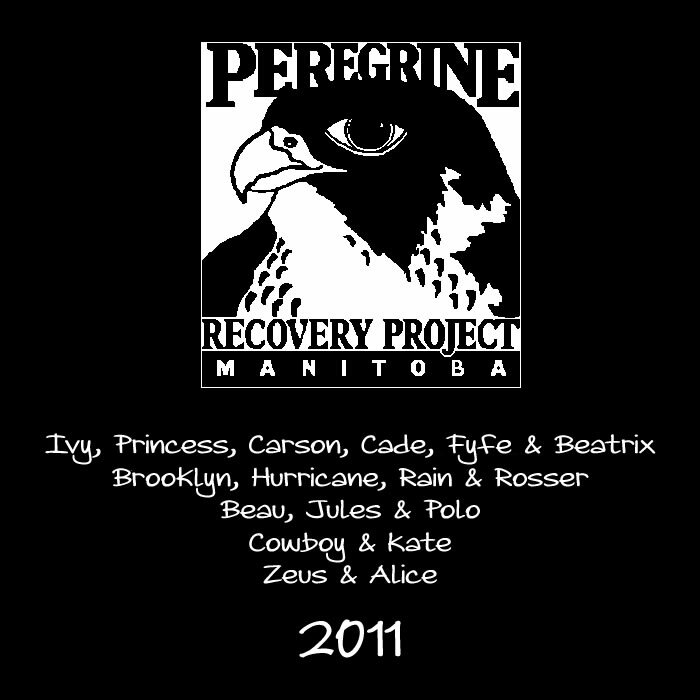 On the back of the shirt, we have added the Project logo and all the names of the 2010 nesting adults and their young this year: Ivy, Princess, Loki, Thor, Isis-Kali & Aura at the Radisson; Brooklyn, Hurricane, Mac & Kenzie in Brandon; and Beau, Jules, Annie, Aggie & Nero in West Winnipeg.